Mason jars are pretty much my favorite thing ever, and they have been for a very long time. I even used them at my wedding reception years ago, and I had no idea then how popular they would become. 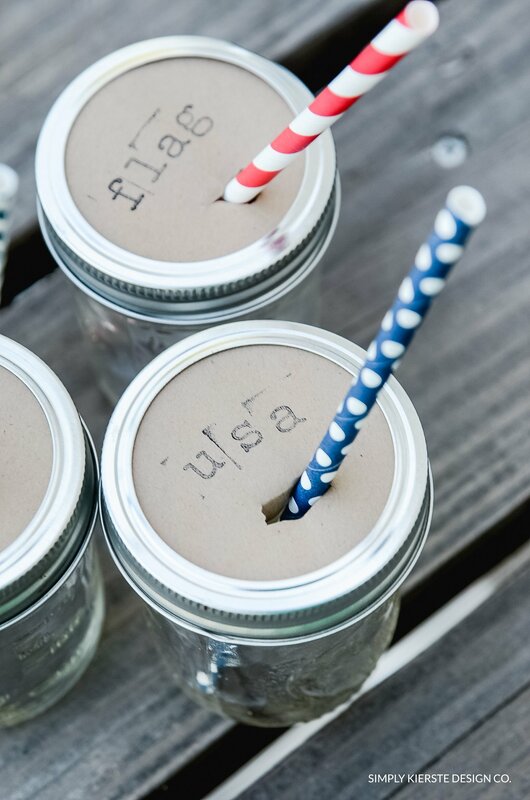 They have so many uses, but I’m sure you’ll agree that they are super cute as drinking glasses, and they’re perfect for all of your summer entertaining. I often use cupcake liners as easy mason jar toppers for gifts and as drinking glasses, but this time around I was looking for something I could personalize. 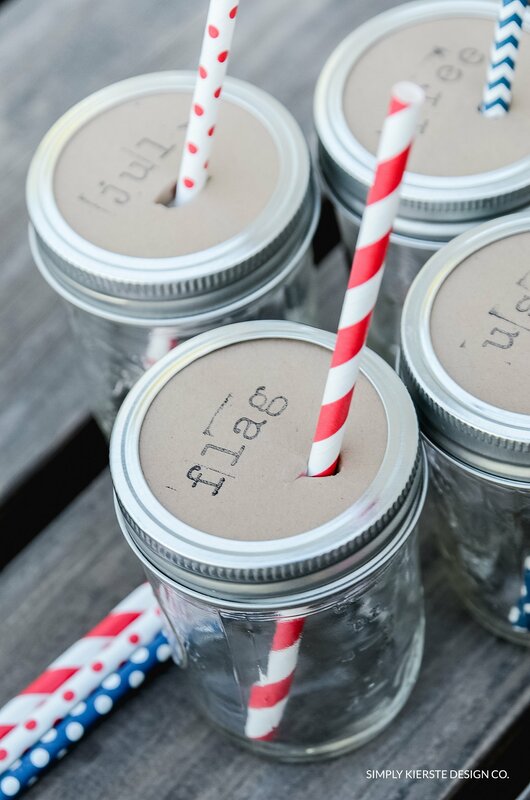 I decided to make a bunch of mason jar drink toppers for the 4th of July, and I LOVE how they turned out! 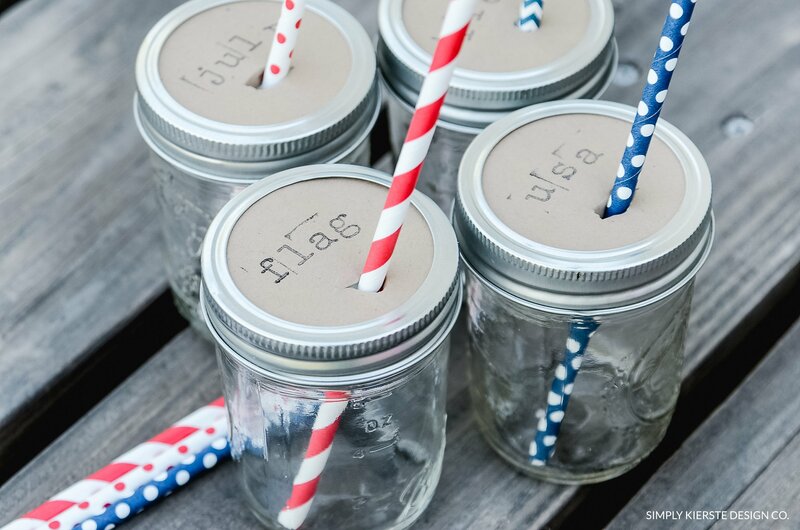 I stamped patriotic words on the tops, and it’s a fun & easy way to personalize them. How adorable would it be to stamp names, and use them as place cards! Super easy and so inexpensive, which is my favorite way to do things. Trace the lid of the mason jar onto the kraft card stock–one per jar you need–then cut them out. Stamp desired text on each circle–keeping in mind where you want the hole for the straw to go. Gently fold each circle over just enough so that you can make a little cut in the center–this is where the straw will go through. Put a circle on top of each jar in place of the lid, then screw on the ring. Poke a straw through the slit you made. That’s it! 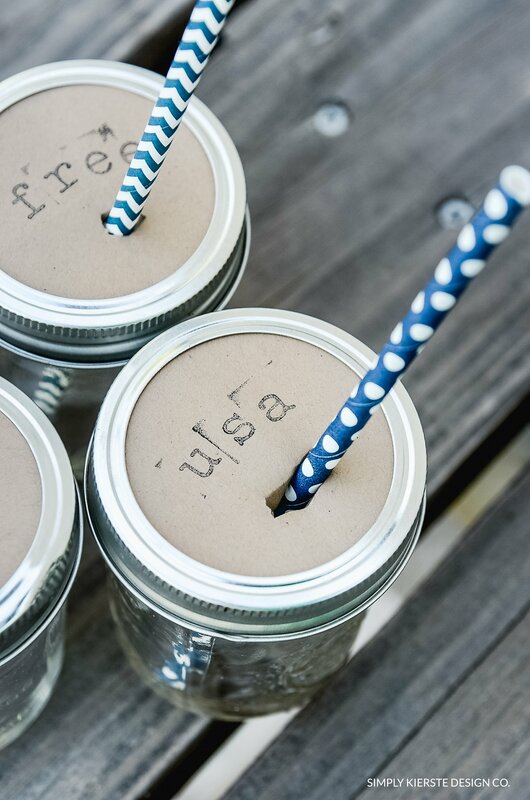 Adorable Mason Jar Drink Toppers! could you use a hole punch for the straw hole? Fun idea! Leave out a Sharpie, and let everyone write their name on! !